It is a gorgeous day in Cincinnati, and I hope that wherever you may be you are finding yourself with a beautiful day as well! This morning I woke up bright and early at 6:45 a.m. for first run with the running group! Although I didn’t need to meet them until 8, I wanted to get up, hydrate, eat & digest. My go to pre-run breakfast is a simple one, but it works to fuel me up! I toasted a slice of Ezekial bread and topped it with peanut butter, honey, and a few banana slices. When the mileage increases, I usually add another slice but since today’s run was only 3.5 miles one slice was enough for me! Everyone is different in regards to pre-run meals so keep that in mind! I’ve just found that this meal digests well before my runs! I got home, and was ravenous! The first thing I did when I got back was to test out Nuun hydration tablets! I bought nuun at the running store the other week and was excited to try it out. 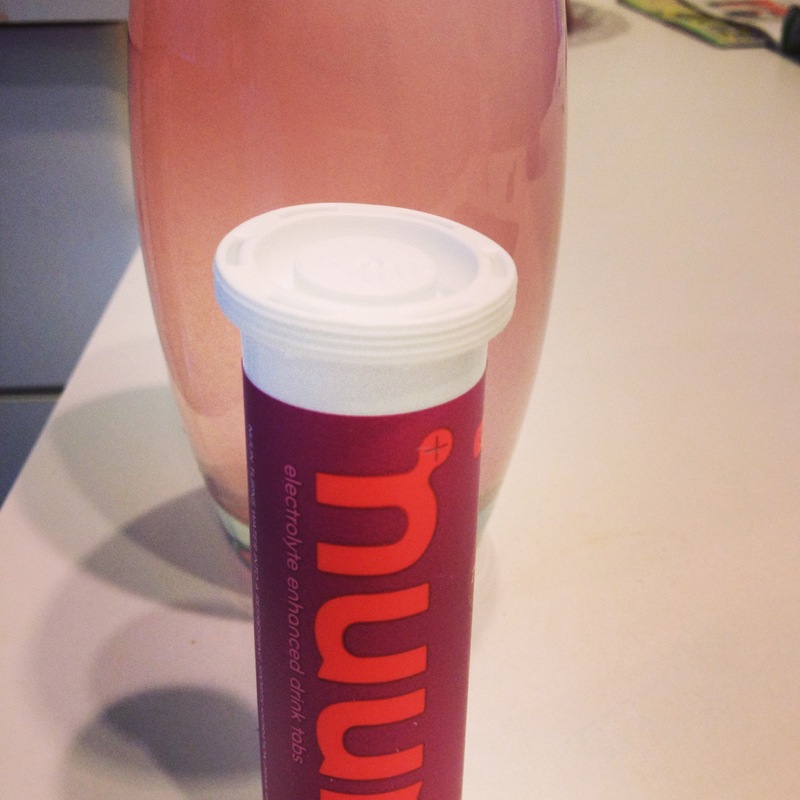 Nuun tablets turn your water into a sports drink without sugar! It’s loaded with electrolytes and turns your water a little fizzy. I tried out the tri-berry flavor and LOVED it! It was really good and is a great alternative to drinks like gatorade or powerade! I’ll definitely be incorporating nuun into my 1/2 marathon training hydration! Next up was breakfast + coffee!! 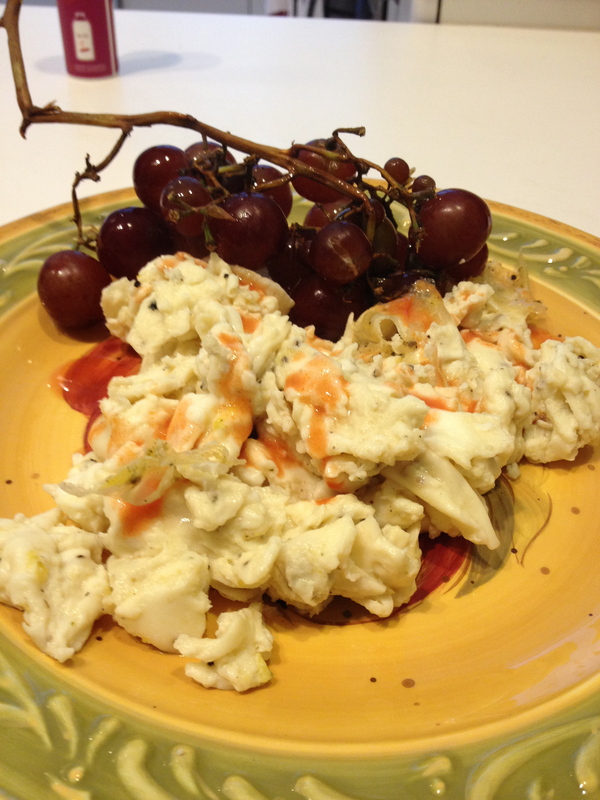 I kept it simple with 1 egg and 2 egg whites scrambled topped with hot sauce & a side of grapes. I have to say, getting up early on a Saturday and getting my workout in before 9:00 really made me feel like I was going to be productive with my day. I even got some studying in! It’s amazing what you can accomplish when you set your intentions. ← Love me Some Oats! Thank you!! I hope to continue with this pace group throughout training!